"The Co-operative Academy of Manchester is very supportive of any charity event which raises aspirations and life chances of others. Our values of fairness , ambition and respect for others are at the heart of our Academy. Taking part in Runway on the Runway has been a very positive way to support the goals of young people who deserve the opportunity to achieve"
Taking part in Runway on the Runway means so much to the Academy and its students, as it gives them a once in a lifetime opportunity that they otherwise wouldn't have had. It also gives them a chance to raise awareness of the charities supported and the help they provide to children, teenagers and young adults. The students also gained invaluable experience and skills working alongside a fantastic team of designers, hairdressers, choreographers and fundraisers, and this will help them in their future prospects. Even though we had ten models walking the catwalk on the night, every student and staff member became involved in one way or another, either by supporting our fundraising efforts or helping with the planning, choreography, hair or make-up. Sian Welsh, School Receptionist, raised over £2,000 by shaving her long lustrous locks and subsequently donating them to make wigs for children who have lost their hair due to cancer treatment. 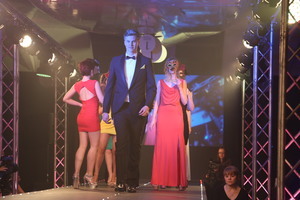 The Academy has a strong sense of community and caring for others and were very proud to be on the catwalk last March. Top Manchester designer Vicky Martin was delighted to dress the Co-operative Academy models and support Runway on the Runway. The Vicky Martin label was founded in 1987 to create evening wear and sassy daywear for young confident women looking for an alternative to mainstream fashion. Collections appeal to girls with personal style who appreciate good design and individuality, who may choose to impress in a sophisticated ball gown, or entertain in something more cheeky or girly. For prom-night, wedding or black-tie functions, Vicky Martin offers off-the-peg designs, a special order service where you can tailor one of our existing styles to your own requirements, or a bespoke service where you can work with Vicky to create the perfect outfit from scratch - for any occasion. A bespoke service is also offered for brides to be, where each bride can develop her own unique design, choosing fabrics and embellishments to create her dream wedding dress and/ or bridesmaids dresses. All design and production is in-house in our Manchester-based workshop and new styles are created and individually made each every week. "I felt being involved in Runway on the Runway would teach our students many social skills and give them experience of working with the top people in this field. We also wanted to raise money for charity." The designer prom dresses from Forever Unique are guaranteed to delight. Whether you are looking for a special designer prom dress for a ball or unique prom dresses more suited for going out on the town, we have the perfect designer dress for every occasion. From short prom dresses to long prom dresses. have a look at our fabulous selection and pick out the one that suits your style and the type of event you are going to. Visit www.foreverunique.co.uk to view our latest designs. "I am thrilled that our students are able to take part in such an exciting project, for such worthy causes." 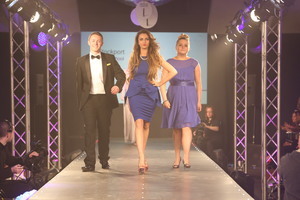 In late autumn, Stockport school received an invitation to take part in the fabulous Runway on the Runway Fashion Show. We knew everyone couldn't model in the actual fashion show but everyone could get involved in one way or other, either through helping with the styling (hair and make-up), choreography or fundraising. Eight girls and two boys were chosen from the many that volunteered and we had lots of meetings and rehearsals during the run-up to the show. Several trips to the airport's Runway Visitor Park were arranged to give us a taste of what to expect and helped build the anticipation and the excitement. More rehearsals took place to make sure that every move was as precise and accurate as it could be with students spending as much of their free time practicing. There was much laughter - and a few tears - along the way. A real sense of community began to spread through the school and the catwalk team received ultimate support from everyone, students and teachers alike. From beautiful bandeaus to gorgeous maxis. Coast aims to make your Prom night unforgettable. Coast is always in tune with the latest trends on the catwalk while staying true to its own uniwue handwriting. The dresses are modern, contemporary and are inspired by everything, not just the catwalk. Coast believes that all women should be able to find something to make them look and feel fabulous for all the special occasions in their life. We were thrilled to have Coast as our designer. Coast is one of the most successful occasion-wear brands in the UK, and models spent hours searching Coast's website. There was so much to choose from - we were really spoiled for choice. "We at Alsager School are delighted to be involved in such a worthwhile and exciting event as Runway on the Runway. So many staff, pupils and parents at the school have been involved and I would like to thank them for all their efforts. Olivia has been an inspiration to us all here at Alsager School for the last two years - her determination and positive outlook makes her a role model for us all. She has been the catalyst for so many fundraising events at the school and now the fashion show is raising huge sums of money for fantastic causes including teenage Cancer Trust. Everyone is looking forward to the glitz and glamour of the evening"
As a business and enterprise school, we have been coming up with lots of different ways to raise money for the chosen charities. Teenage Cancer Trust is very close to our hearts as one of our very treasured students, Olivia, experienced and overcame cancer, and we want to help other teens who are going through the same thing, One of our fundraisers was a Valentines Day delivery service where recipients received a Love Hearts card and a roll of the very popular sweets. We are very excited to be part of the Runway on the Runway show. Our models, make-up artists and choreographers have been working extremely hard for the few weeks leading up to our debut on the catwalk. We are all having such a great experience. Each season Little Mistress adapts the latest catwalk trends and in-season colours to create covetable collections that are feminine, chic, pretty, affordable and wearable. All Little Mistress pieces are designed in-house, flatter the feminine figure and seduce the wearer with their exquisite embellished detailing, lush layered textures and unique prints. With a rapidly growing reputation as a "must have" label, it is difficult not to fall in love with this fun, adorable brand. Little Mistress has a growing customer fan base and is quickly becoming a favourite with celebrities, who are eager to be seen in the latest Little Mistress looks. STUDENTS FROM ALSAGER SCHOOL MODELLED DRESSES FROM THE LITTLE MISTRESS SS13 COLLECTION. "It gives me great pleasure to add my support to the work our young models are doing to help raise money for charity. I know they have learnt lots about fashion, beauty, and event management, as well as planning and organising skills to enable them to take part in the show. The project has been a very positive experience for all those involved." Tytherington High School has been involved in many charity fundraising events but were unfamiliar with the Teenage Cancer Trust, so it was a good opportunity to raise awareness as well as combining our love of charity work and fashion. We were proud to be modelling dresses from the Mori Lee collection. We thought they were phenomenal! To raise money we sold candy canes at Christmas and we got teachers to bring in embarrassing photos of themselves when they were younger. Everyone had fun guessing who was who. We also had a non-uniform day and a cake sale on Valentine's day. Any excuse not to wear our uniform and to eat cake! Runway on the Runway inspired us to hold our own fashion show in school too where we modelled garments made by the students ourselves in the A Level Textile class. Our headmaster is very proud and supportive of our work. Madeline Gardner is an internationally recognised bridal designer from New Yourk who designs the Mori Lee collections, including bridal. bridesmaids, prom and occasion wear. From ballgowns to slim sheaths, trendy short cocktail dresses to fully beaded floor length gowns, you'll be sure to find the perfect prom dress in the Paparazzi prom collection. Hollywood glamour and sultry appeal epitomises this collection for any young woman who wants to stand out from the crowd. Visit http://www.morilee.com/prom for the latest prom collection. "A marvellous opportunity for our learners to raise money for good causes whilst enjoying the exceptional experience of performing at such a prestigious event"
Cheadle and Marple Sixth Form College have risen to the challenge, and it has been quite a journey. Some of the models are currently studying travel and tourism, so the opportunity to "strut their stuff" underneath the iconic Concorde is beyond exciting. The fantastic hair, beauty and catwalk workshops will help us deliver a stylish and fun performance at this big event. Lipsy was the perfect choice for the Cheadle & Marple SFC models who love the brand, and loved their trip into the Lipsy store for their styling session! LIPSY is a young British fashion brand founded in the heart of London. Lipsy is dedicated to ensuring the hottest looks move from the catwalk to the high street in the blink of an eye. Loved by celebrities and style-seekers alike its collection is sure to add impact to any wardrobe. The Lipsy VIP collection is perfect for any red carpet event and prom style dresses will excite any young fashion lover. The collection is available from Lipsy's 50 nationwide stores and online at: www.lipsy.co.uk. "We wanted to get involved in this fashion show because our students will see first-hand how a promotional event of this magnitude is co-ordinated. It's also a great way to raise awareness of teenage cancer." At Wilmslow High School we aim to enable our young people to become caring and responsible citizens able to contribute to school and the wider community. We are passionate about ensuring all students benefit from their education and that success is not just measured in examination results, and expect our students to take part in as many learning opportunities beyond the classroom. Runway on the Runway was another valuable learning opportunity. Students have been able to witness first-hand how a promotional event of this magnitude is co-ordinated. The opportunity to work with professional make-up artists, stylists and choreographers has been amazing. Students can look back with pride and achievement on their fantastic teamwork and fundraising efforts. BCBG stands for Bon Chic Bon Genere which translated means, Good Style, Good Attitude. This fashion powerhouse has evolved into one of the hottest names in the fashion industry and has a loyal following of Hollywoods top celebrities. BCBG is part of the Maz Azria stable of contemporary fashion labels which now include Herve Ledger and this is reflected in this particular collection. These fabulous dresses with style and amazing silhouettes are always guaranteed to make heads turn. See the latest BCBG collection www.bcbg.com at Harvey Nichols, Manchester www.harveynichols.co.uk. We would like to say a huge thank-you to the wonderful fashion team at Harvey Nichols in Manchester for our fantastic styling afternoon. "The students have been great. They have been so committed to rehearsals as they don't want to let anyone down and want to make the night one to remember for all those that have come to support." The students at Knutsford Academy were extremely honoured to be asked to be part of such a worthy project. Like all schools, "prom fever" hits Knutsford Academy in the summer with lots of excited students getting ready for some fun and to create lasting memories. Watching the video of the young oncology patients and meeting these inspirational girls has enabled our students to see how much going to prom means to some young people. It has inspired them to raise as much money as possible for the charities that help people of their own age at such a difficult time. There have been a few cases of young students with serious illnesses at the school too, so it is important to raise awareness. Ted Baker alludes quality, outstanding attention to detail and a rather quirky British sense of humour. Put it all together and it's esy to see why Ted Baker is no ordinary designer label. "Being involved in Runway on the Runway has been an amazing opportunity. When I saw the video of teenagers suffering and overcoming cancer, I knew I wanted to get involved. Fashion is a career I am interesed in pursuing after college and this event has certainly fuelled my interest." We were so thrilled to be selected to take part in this incredible charity event. We knew from the start that this kind of event would draw so much support from the whole college as charity work is at the heart of the mission and ethos of Xaverian College. It has been a great pleasure to work with the Runway on the Runway team - their passion has inspired us and given our students the opportunity to learn more about staging such a huge event. We have been helped along the way by professional stylists who have given up their time to support us and the input of a professional choreographer, who has helped us pull together a dramatic narrative routine for the catwalk. It was clear from our first meeting with the Runway on the Runway team, how professionally organised this event was going to be and how committed everyone was to making it a huge success. We are thrilled to introduce Mancunian Nicola Metcalfe, who is a rising star in the world of fashion in Manchester. Nicola launched her new fashion collection at Runway on the Runway. Nicola's designs are dark and edgy with a gothic twist. Nicola graduated with a First Class Honours Degree in Fashion Design from Liverpool's John Moore University. Her debut on the Runway on the Runway catwalk marks the latest stage in her fledgling career. Nicola has just opened her first boutique at 294 Barlow Moor Road, Chorlton, M21 8HA. "I've always wanted to give back to charity because the community has given so much to me. I really love make-up artistry and it's a way of carrying out my hobby which I truly love and am passionate about." Since we started rehearsing several months ago, we have been working hard to ensure that everything goes smoothly on the Big Night. The girls were thrilled to learn that they would be modelling the Sheri Hill collection sent from the USA by Sheri's daughter Alicia. The models had great support from the school and other students that helped with the make-up, hair and choreography. Opportunities were also there for those students who wanted to get involved in photography and journalism. Now that we have reached our destination, everyone agrees how much fun it has been and we so want to make the night a great success. USA designer Sherri Hill's exclusive collection's epitomise the fashionable lifestyle of today's contemporary woman. Each look is designed to enhance the female form with fashion-forward styling and wearability. Sherri Hill has rapidly expanded into a global brand with its design studio in 5th Avenue New York. Visit www.sherrihill.com to see the latest prom collection.